Google is the big name in driverless technology, but the U.S. Army has had convoys of self-driving vehicles in testing for years. The U.S. Army Tank Automotive Research, Development and Engineering Center in Warren has two examples of this technology on display at the Detroit auto show: systems mounted on an M915 tractor trailer and its commercial counterpart, a Cummins-powered Peterbilt Class 8 semi-tractor. The Army believes the self-driving vehicles could be ideal during humanitarian relief missions in a natural disaster or for resupplying troops in the field, recognizing opportunities for cost savings and fewer crashes. Michigan Gov. Rick Snyder toured the Army's exhibit Tuesday, along with Macomb County, Michigan, Executive Mark A. Hackel. 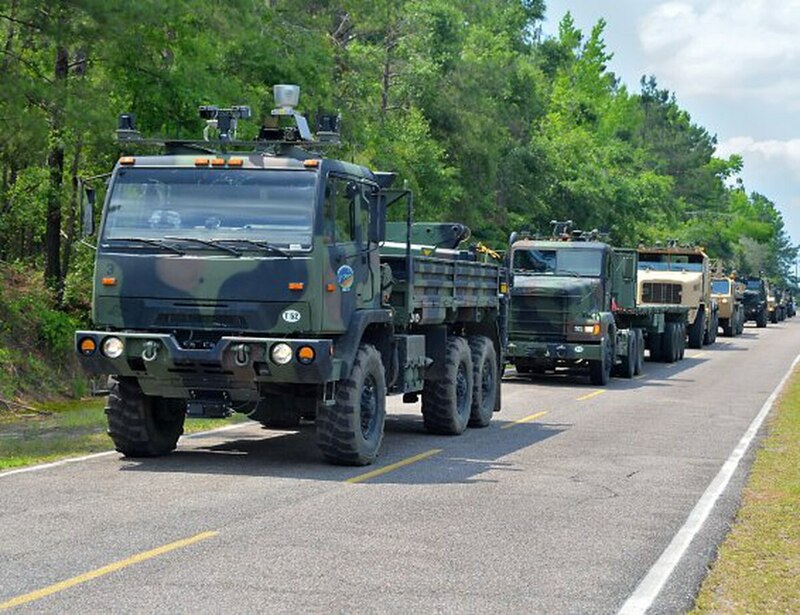 Driverless technology could reduce the risk of injury or death for convoys traveling through territory with hidden roadside bombs, said Bernard Thiesen, technical manager for Autonomous Mobility Appliqué Systems at TARDEC. "We're trying to protect our soldiers. We wanted to provide them the greatest amount of stand-off distance from whatever the danger is," Thiesen said. Paul D. Rogers, director of the TARDEC program, said many attacks on soldiers occur along resupply routes, and autonomous capability would require fewer soldiers to be in the vehicle, lessening exposure. "That not only lessens the risk for the soldier, but we can move the same amount of material, equipment and supplies with fewer soldiers, so we become much more efficient," Rogers said. Manpower is a major expense in the military, including drivers who always travel with a backup, "safety" driver who is present in case the main driver gets injured or fatigued. "Anything we can do to take some of that cognitive burden off the driver, to reduce the need for a second driver for safety reasons, lessens the number of people we need in a vehicle, which means the same number of people can do the same amount of work," Rogers said. The autonomous vehicles are also equipped with the collision-avoidance, safety functions that would protect soldiers and reduce the medical costs that stem from crashes, he said. Soldiers don't always drive on established roadways, at times making some extreme cross-country trips across difficult or dangerous terrain. Autonomous vehicles would allow soldiers to avoid those trips, Rogers said. The Army trucks at the North American International Auto Show have three robotic modes, including "tele-operation," which allows a driver to operate the truck from a remote location. The vehicles can also be programmed to self-navigate either by GPS or by "learning" landmarks along a route, or to simply "follow the leader." "Think of it as a train with no linkage in between," Thiesen said. The first vehicle is driven either remotely or through a pre-programmed navigation plan, and the driverless convoy behind it automatically follows the first vehicle, Thiesen said. The first of the capabilities deployed in the field will likely be the collision-avoidance enhancements within five to seven years, Rogers said. TARDEC has partnered with private firms such as Lockheed Martin to draw on some of these latest automotive technologies in the commercial and public sectors. "We're very excited about what's going on with Google and by what the auto industry is doing because they're driving an economy of scale across the technologies that we need for our military applications," Rogers said. "Although we've been at it for a couple decades, and we are very mature in our understanding of the capability, what they have brought in the last six years is the drastic price reduction that makes it affordable for us now to field it to the U.S. Army."